Providing you the best range of paste filling machine, double head liquid filling machine, granule filling machine, liquid filling machine and double head paste filling machine with effective & timely delivery. We offer Paste Filling Machine ideal for packing of filling products at any kinds of a ropy pitch from a uniform to viscosity. Easy to operate, energy efficient and cost effective, the Filling machines offered by us are available in different models SPPF-500 and SPPF-1000to diverse applications. Paste piston fillers are designed for filling products at any kinds of a ropy pitch from a uniform to viscosity. Paste piston filler is best suited for medicine, chemistry, lube and daily merchandise etc. 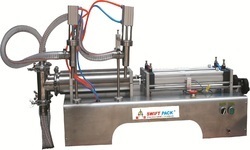 Shri Vinayak Packaging Machine Pvt. 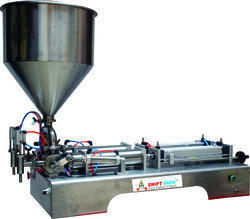 Ltd presents its newly manufactured Double Head Liquid Filling Machine. Fabricated with the help of latest technology, these machines are designed for efficient delivery of automatic operations, which also includes the packaging of viscous and non-viscous products. We are offering Double Head Liquid Filling Machine to our client. 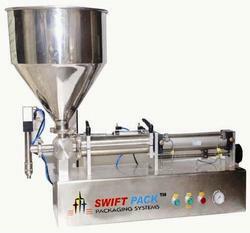 We offer Granule Filling Machine ideal for packing of granule such as sugar, rice, and pulses etc. Automatic granule packaging machine adopts PLC control bag length regulation and adjustable volumetric cups for measurement. It is suitable for heat sealable compound materials such as single Paper/PE, Cellophane/PE, Aluminum foil /PE, BOPP/PE, Nylon/PE etc. Easy to operate, energy efficient and cost effective, the vacuum packing machines offered by us are available in different models SPGF-500 and SPGF-1000 to diverse applications. 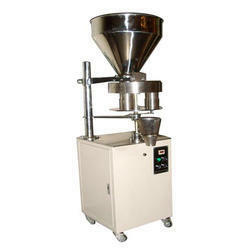 Automatic granule/powder filling machine fills the products by the adjustable volumetric cups. Automatic granule/powder filling machine is applied to fill granule/powdered materials in the fields of food, daily chemical and medicine etc. 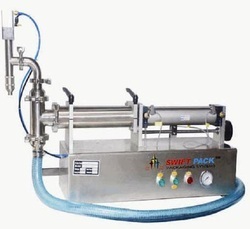 We offer Liquid Filling Machine ideal for packing of filling products at any kinds of liquid. Easy to operate, energy efficient and cost effective, the Filling Machines offered by us are available in different models SPLF-500 and SPLF-1000 to diverse applications. Liquid piston filler is best suited for medicine, chemistry, lube and daily merchandise etc. 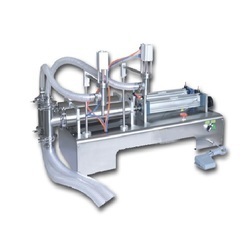 Liquid piston fillers are designed for filling products at any kinds of liquid. Liquid piston filler is best suited for medicine, chemistry, lube and daily merchandise etc. We are offering Double Head Paste Filling Machine to our client.